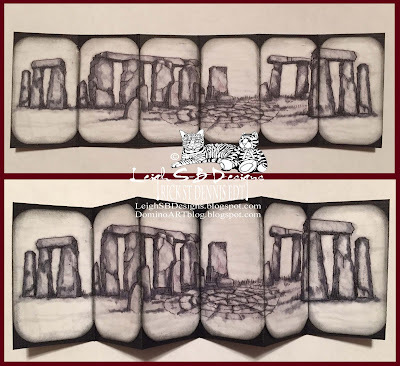 Velvet Paw Creations: "Dark Etchings" Domino Book for Rick St Dennis EDT! 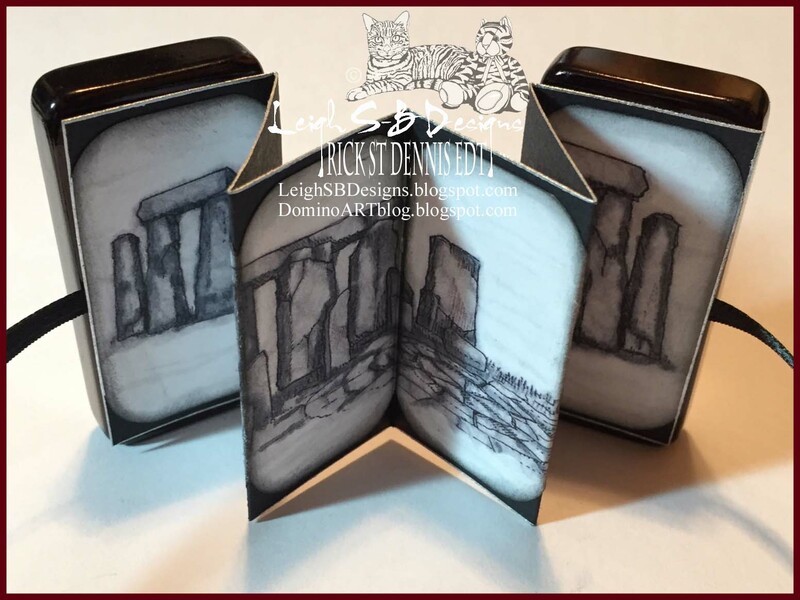 "Dark Etchings" Domino Book for Rick St Dennis EDT! I'm super stoked to now be on the fabulous Rick St Dennis Elite Design Team! Rick's images in both digi and rubber are simply stunning and there's a huge variety of imagery to suit every possible taste! Check out all the digis in his Zibbet and Etsy stores and some real rubber is available Here! My project today is a Domino Book and is another addition to a series of "Dark Etchings" I've been having fun with for a while now. I call them 'dark etchnings' because I create monochromatic black and gray pieces that remind me of traditional etched prints. Previous ones were done with Black Soot Distress Ink on watercolour paper and this one is done with Copics and Sharpie markers. Check out my other Rick St Dennis ones HERE! 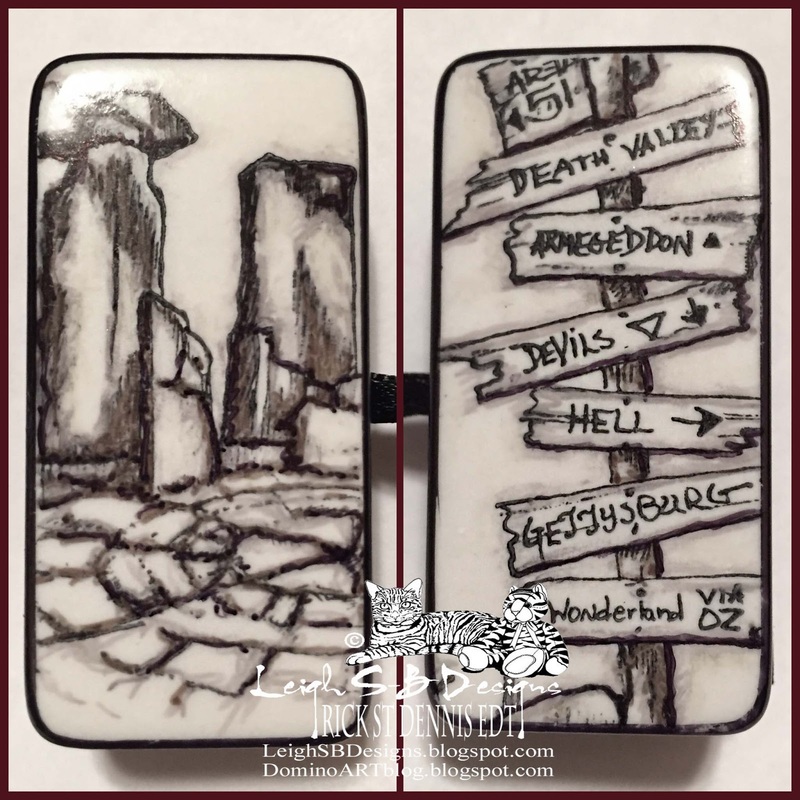 The dominoes are stamped with black StazOn ink and coloured with gray and black Sharpies. The edges and sides with the dots are coloured solid black. Here's the pages of the book. The scene is a compilation of Rick St Dennis "Haunted Places #1" digis coloured with Copics in shades of gray. Sadly the rubber is no longer available and the digis aren't up in the RSD stores so ask for the digis if you need them but this technique is well suited for lots of the images that are available! Check out all the digis in the Zibbet and Etsy stores. The edges of each page have Black Soot Distress Ink applied and the black background has a metallic silver edging which you can see in the photo below. Here's the completed Domino Book with a black ribbon tied in a bow, the ribbon has silver wire wrapped around the ends. Wonderful, love the etchings and the fab domino book!